Being home, back from transplant and her last chance at a “normal” life, has been both a blessing and a challenge. The last few weeks we have experienced extreme joy and gratitude as a family; being together again, under the same roof in time for the holidays, and all of the festivities that come with this time of year. Abbigail has been slowly recovering from her transplant with very few complications and she has been regaining strength in her muscles, walking, “running” and even doing the stairs again. She isn’t showing any further signs of dangerous infections and she has been responding well to her new medications. It is only a few weeks to Christmas and there are no signs that lead us to believe she will be having Christmas in the hospital this year!!! She’s slept in her own bed now for 18 nights, she’s been able to stop taking the dangerously renal toxic antivirals, her CVL has continued to work, with at home maintenance, and she no longer cries for her brother’s in sadness. 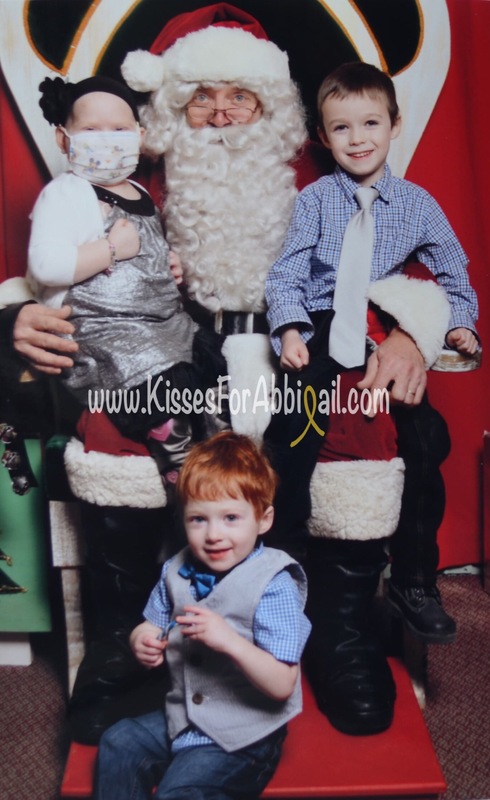 Abbigail saw her Princess friends at the mall last week, she also visited with Santa and shared with him her Christmas wishes, and she even shopped for her brothers. She has done so well, come so so far and been able to do so much since being home. We are so grateful for all of these tiny miracles in her life. Our bright and bubbly four year old girl is still lost within herself. There isn’t often an hour that passes in her day that she doesn’t spend screaming, crying, hurting or fighting with herself or us. Almost any activity, outing or event attempted, with her alone or as a family, is interrupted or abruptly brought to an end, in order to calm her or distract her from her own obsessions and thoughts. 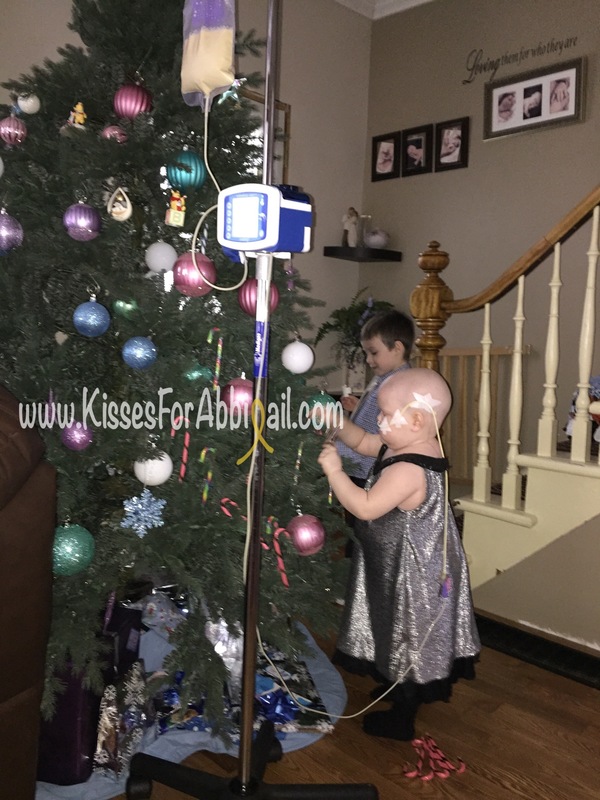 During her moments of play with her brothers, as we decorated our Christmas tree and have family meals, Abbigail is followed by a tall, heavy and cold IV pole; which holds her feeding pump. She still requires 24 hour NG feeds; which is fed through a tube inserted into her nose and through to her stomach. Since her conditioning chemo began, the first week of October, Abbigail has not eaten more than a couple hundred calories on a good day, so she continues to painfully have her NG tube replaced every few weeks to ensure she is nourished enough for her body to recover. When Abbigail asks for food, of any kind (only those bacteria free of course) you can be sure we do whatever means necessary to accommodate and promote her eating by mouth again, even if that means leaving the table, shortening an activity or changing our plans completely. Being able to leave the house is not easy; ensuring we have all of her central line emergency supplies, double checking we have the hand sanitizer and wipes and if we plan on being out longer than an hour we must bring her feeding supplies too, including syringes, adapters, sterile water, formula and pump. Our girl loves to shop and it brings her joy to hold a toonie and pay the “deedee” (cashier) but you will have to look through her mask to see her smile since anytime she leaves the house she is required to protect herself from germs with a mask in addition to the hand cleaning. You also won’t find Abbigail in crowds or shopping during peak times. I had to contact the princess company and have alternate arrangements made for her to meet the princesses briefly last weekend at the back entrance of the mall an hour before the crowd was to arrive to see them introduce Santa, then we raced the kids over to the other end of town to see Santa without the crowds. 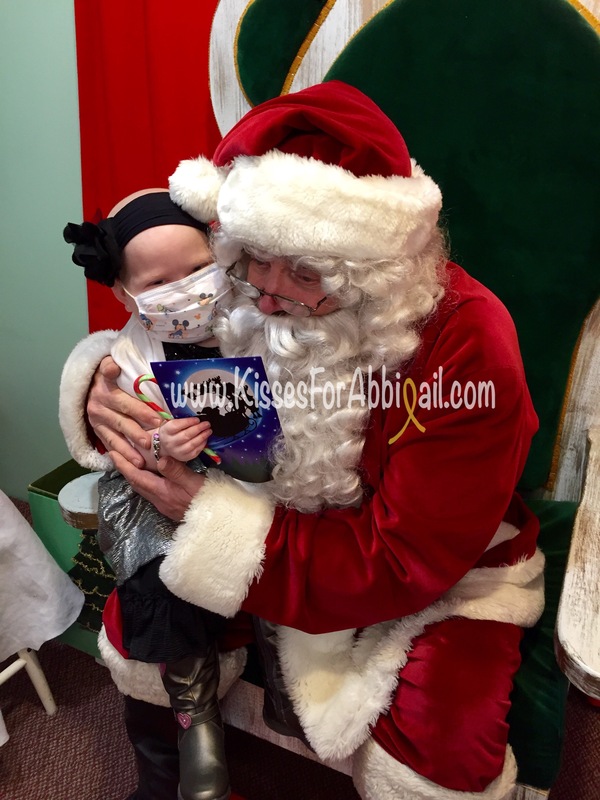 Abbigail still fights each and everyday for her miracle…she struggles through most hours,in one way or an other. At home we are getting through the days, trying not to think of her reality every waking moment. Come time to speak to the doctors, Abbigail is consumed by her friends company or Molly the Clown’s loving laughs and entertainment. If only I could ignore the reality. Her liver engines continue to climb, her kidney function remains fragile and at risk and her immune function is still compromised. All side effects of lethal chemotherapies and years and years of dangerous medications originally designed for either adults or other diseases. 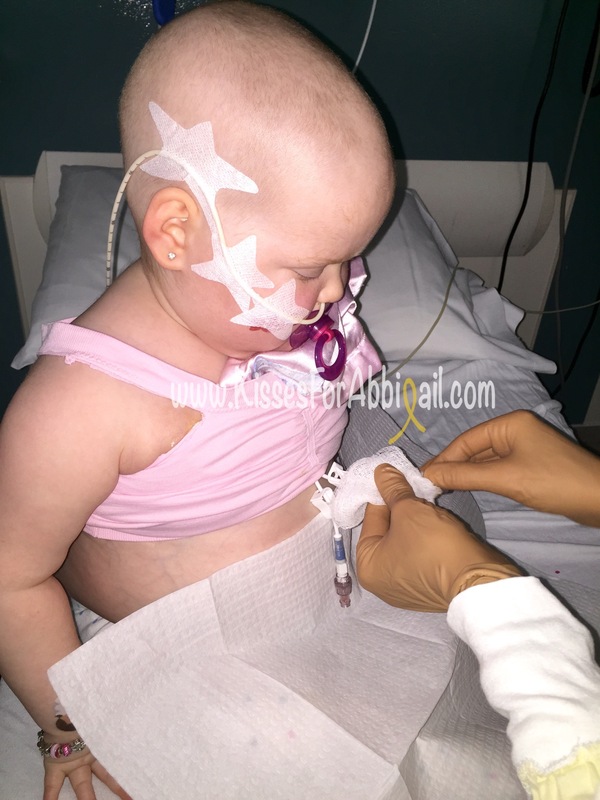 Abbigail has made progress with her physical recovery; her marrow is producing cells again, although not yet functioning, we have no reason to believe they won’t be in time and her physical OMS symptoms have been improving and some even disappearing. Her hair started to grow back again but the bald appearance and mistakes that she is a boy still stand out as a reminder of her pain endured and struggles to come. The next time you see us or Abbigail, know that the answer to your question “how is she” isn’t as easy to answer as you may think. Although the most important thing is she is home with us, there is so much more that can not be explained with words. This road is still winding and unfortunately we do not have an end in sight yet, so please understand that when I say it is complicated or brush it off, that I am not being short, but rather emotional and heartbroken. Almost three years ago we were told she had cancer and OMS but that she was among the “lucky” ones and should be back to normal living before the year was up. Here we are today still on constant alert, administering dozens of medications every 6 hours and still calling CHEO our home. I have a hard time considering that she was “a lucky one.” My heart is aching daily for our constant complicated struggles as a family and for our daughter’s endless pain and suffering, but I am grateful for the hugs each night, the screams for mummy and the love we share as we celebrate Christmas in our new normal way.